The EM500EV-MB0 motherboard comes with the EM500 module (installed on a socket). A schematic diagram of the EM500EV-MB0 board can be found on Tibbo website. 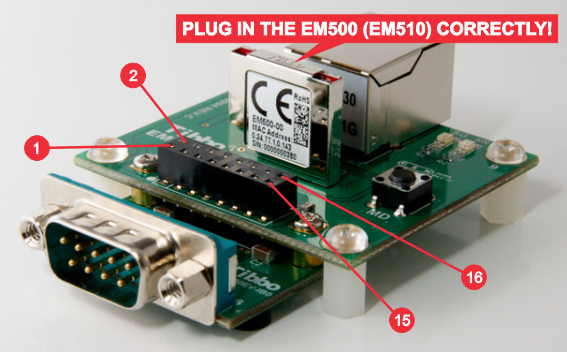 It is physically possible to plug the EM500 module into the EM500EV-MB0 in reverse. Doing so may irreversibly damage the device. Plug the EM500 as shown on the picture above. •A power jack and a switching regulator with 3.3V output. This 3.3V power is supplied to the EM500 and is also provided on the interface board connector (see below). •An MD button, which is connected to the MD input of the EM500. •Green and red dual-function status LEDs. The term "dual-function" refers to the fact that these LEDs are also used for Ethernet link status indication. (1) Directly connected to the corresponding pin of the EM500.